(Originally Posted 2/17/2015) The next time you feel like hosting a banquet (and who doesn’t feel like that from time to time?) let me put in a plug for a Chinese one. Yes, I’m a major fan of the Swedish smorgasbord – but the beauty of the Chinese version is that the dishes are all of equal importance (no high pressure piece de resistance) and it’s designed for an oven-free cooking culture where very few of the dishes need to get to the table piping hot. Getting lots of dishes to the table in “just off the stove” form is maddening. I need a wide margin of error. Planning a Chinese meal is an art in itself. It calls for the selecting of individual dishes, relating them to one another and working out the harmonies and contrasts between them. 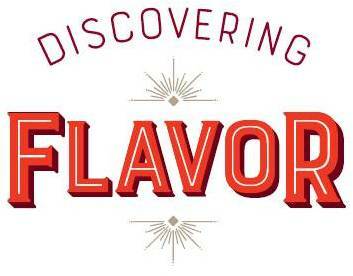 Whatever the ingredients, whether simple or costly, each dish should stimulate the eye, the imagination, and the palate. It should be colorful – never dull, dreary, or drab . . there should be proportion, balance, and variety. There were pages and pages of these and reading through them on the couch made a very pleasant evening while I invented my own menu. Below is what I served with a few tweaks. I don’t like copying recipes from cookbooks online if the author hasn’t posted them. Then again, this book was written in 1966. I’ve included below a few of the recipes to give a sense of the simple, flavorful dishes this book contains and also links to similar recipes found online. For a few of the dishes I went to other (more recent) cookbooks, those do have online links to the recipes. Ginger Martinis – Yeah, this wasn’t in the book. Tea Eggs & Preserved Eggs on Shredded Chinese Cabbage Salad: For the salad, I shredded a small head of cabbage and tossed it with two generous pinches of salt, allowed it to drain 30 minutes, then dressed with lime juice, rice vinegar, sesame oil, sesame seeds. 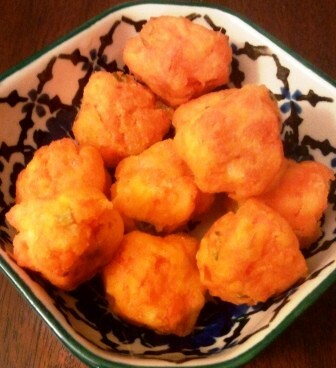 Fried Carrot Balls – They probably have a catchier name in Chinese, but these are great little savory dumplings. Shrimp-Scallion Pancakes – This, *this* is why you should have dried shrimp in your life. On a related note, bugs don’t look gross at all after you’ve worked with dried shrimp. I doubled the recipe, which is given below. 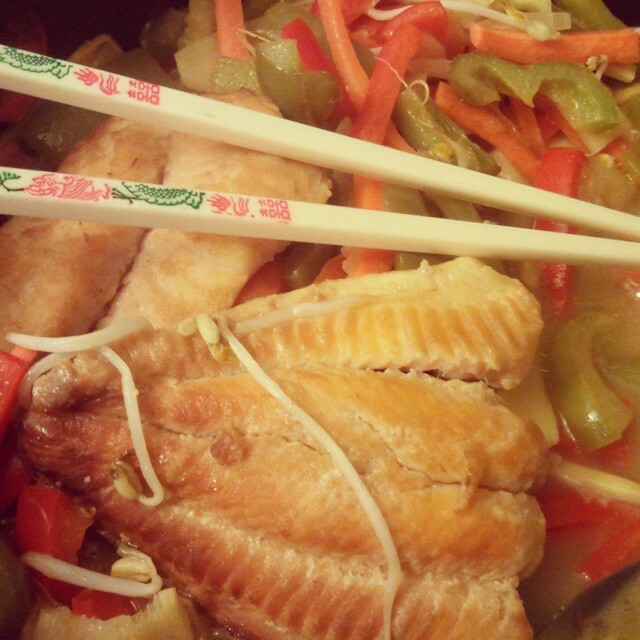 Smoked Fish on Vegetable Stir Fry with Sweet & Pungent Sauce and Crisp-Fried Noodles – The smoked fish technique in the cookbook involves burning sugar inside a foil packet. Very clever. Here is a similar recipe from Serious Eats. Below is the vegetable stir fry recipe. Beef and Garlic in Master Sauce – I had master sauce left from this Splendid Table chicken recipe, which matches the one in the 1,000 Chinese Recipes book. If I had it to do over again, I’d use pork instead of beef. 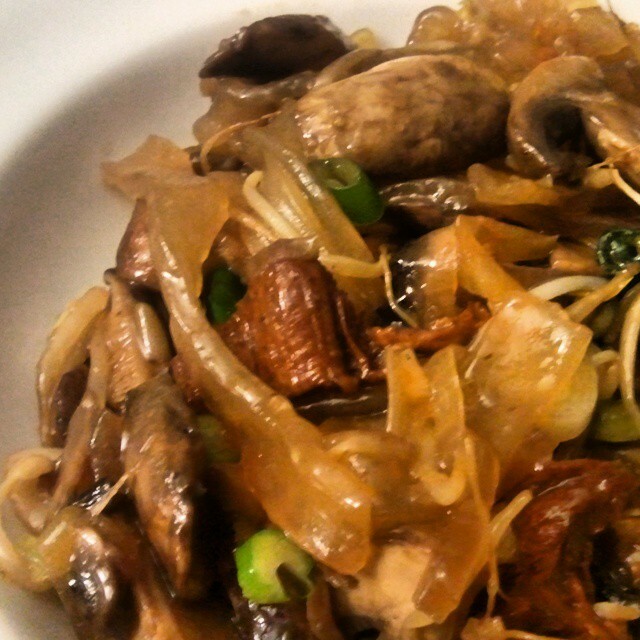 Ho Fun Rice Noodles with Mushrooms – I ended up not following the recipe I intended to (which was Fuchsia Dunlop’s), instead I cooked multiple cups of mixed mushrooms with generous soy sauce, then wide glass noodles with stir fried bean sprouts and on this I put a mix of anchovy-garlic sauce, rice vinegar, cooking sherry and hot sesame oil. Then mixed them together. I realize that’s not a very helpful recipe. 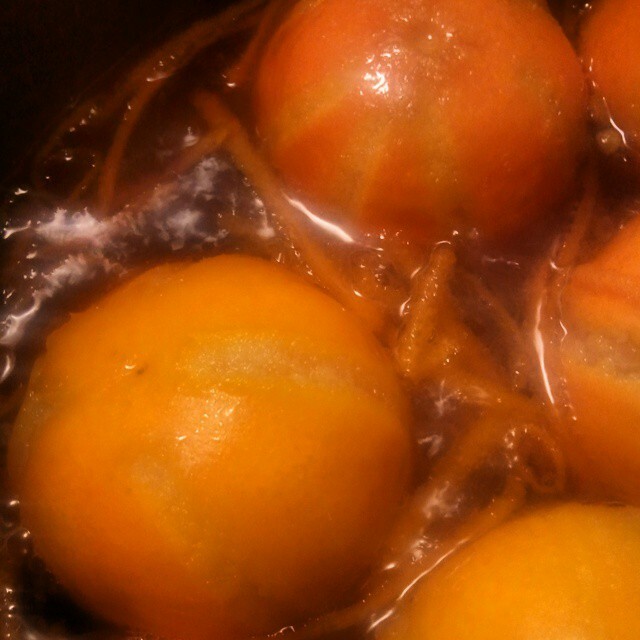 Oranges Candied in Sweet Red Wine over Steamed Sponge Cake – For the oranges I used the recipe in Prune, which was reprinted here. I replaced a cup of the simple syrup with a cup of sweet red Moscato wine. Then peel the oranges and put the fruit and syrup over the sponge cake. These dishes can be made a day or more ahead: Miso soup, carrot balls for frying (fry them right before serving), sweet & pungent sauce, sauce for noodles, tea eggs, mints, candied oranges (need at least 1 day lead time), master sauce (needs at least 1 day lead time). Soak 1 generous Tb small dried shrimp in water. Blend 1 egg, 2/3 cup flour, 1/2 tsp salt, and 1/2 cup stock to a batter. Mince 2 whole scallions and drained shrimp (really mince them), then stir in. Heat 1 tsp oil in 8- or 10-inch skillet over medium heat. Pour in half the batter, tilt pan to distribute evenly. Flip when edges brown. When pancake is all browned remove, add 1 tsp of oil and repeat with remaining batter. Cut pancakes in quarters. The Sweet & Pungent sauce is simply boiling 3/4 cup of water with 1/2 cup sugar, 12 cup cider vinegar, then thickening with a solution of 1 Tb corn starch, 1 Tb soy sauce and 3 Tb cold water (dissolve the corn starch well before adding to the sauce!). This may be more than you need to sauce the vegetables, the rest can go in the fridge. Stir fried vegetables were: 2 green peppers, 1 red bell pepper, 1 julienned carrot, 1 onion, 1 can of bamboo shoots.